This sweet and savory dish will greet your taste buds with joy as you dive into the comfort of this bisque. The hint of sweetness from the warm maple syrup coupled with the cool sour cream compliments the natural flavors and textures of the squash. For added richness and texture top with some toasted pine nuts and freshly grated nutmeg. Using a sharp knife cut acorn squash in half and scoop out seeds. Foil a baking sheet and add water to the bottom covering entire pan. Set squash face down on the baking sheet and place in oven, cooking for about 45 minutes or until fork tender. Set aside to cool, scoop out center with spoon and set aside. In a large sauce pan over medium heat melt butter, add garlic and saute for one minute. Once garlic is fragrant add milk, maple syrup and acorn squash whisking continuously. Allow mixture to thicken and add nutmeg, salt and pepper as desired. Puree mixture with a blender and add chicken stock until soup is thickened to desired consistency. Pour soup into serving bowls, dollop with sour cream in center and sprinkle with parsley. Serve immediately. notes: You can also grate fresh nutmeg on top of the soup to finish off before serving. Another fun idea is to include fresh pomegranate seeds or toasted pine nuts. You can even add roasted corn or pulled chicken for a hearty meal. Accompany with toasted sourdough bread or croutons. 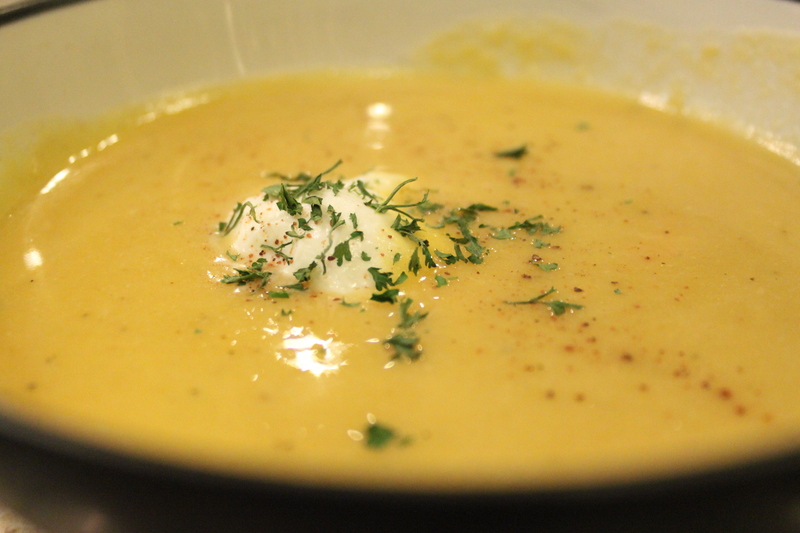 I hope you enjoy this bright, flavorful fall bisque with it’s many finishing options. … join me again on Friday for another one of my experimental recipes! Happy cooking.